With the holiday season on its way, its time to start cranking out those gifts!! And that’s what we are going to do in this episode. 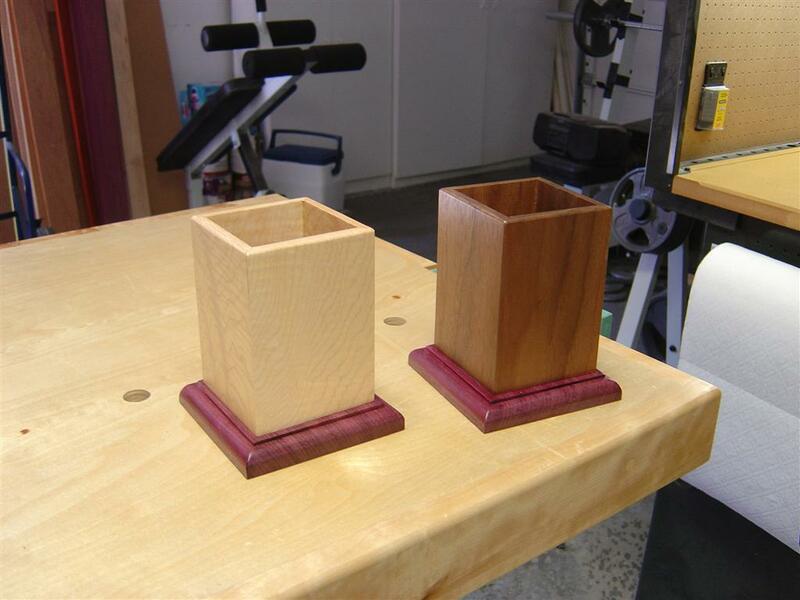 I designed these simple little pencil holders several years ago just as a way of utilizing shop scrap. Turns out they make great gifts too. So get creative and try different color/wood combinations. Its hard to make these things look bad. This video covers wood selection, milling, and assembly of a fancy little pencil holder. Stay tuned for Episode 32 when we focus solely on finishing this piece. And I need to send out a big thank you to Nick for producing the SketchUp drawing above. Simply click the picture and you can download the .skp file. If you don’t have SketchUp, you can download the free version here. I’m currently downloading the podcast and can’t wait for this thrilling new episode. I hope there aren’t any scary parts….Halloween an’ all. Thanks for another informative and entertaining podcast Marc and Nicole. Great work! I feel ghoulishly inspired at your refusal for shoddy things. Yes even pencil boxes. it seems like a lot of work just to fix a teeny lil tiny chipout. but its nice to see that other type a’s exsist. Marc wouldn’t tie, he’d shoot some brads. Just curious, as a novice with all this, why do you let your mitre saw blade stop spinning before lifting it up after a cut? I love your shows and always check out the site – keep up the fantastic work! For someone who constantly promotes shop safety, I’m really surprised at the method you’ve offered for using a chisel. It is generally considered an unsafe practice to hold a chisel with one hand and your work piece with the other. If this is a standard practice for you, gouging your work should be the least of your concerns. When using a chisel, your work should always be clamped. This allows you to hold the chisel with both hands which offers better control and greatly reduces the risk of injury. Hey Maury. Dont be surprise my friend. I am only human. You are exactly right. I do realize that the method I displayed was not the safest possible way to use the chisel. Recognizing this during editing, I thought it critical to give a safety note in the voiceover. And I will be the first to admit that in a working shop, there are many times when the absolute safest practices are not followed. My shop is no exception. But obviously when my shop practices are under the scrutiny of thousands of people, I have to be a lot more diligent about safety. That part of the video was added spur of the moment and was not planned. So I figured I would get the best visual possible with a nice close up and show a cool technique. In my haste, I forgot to take that extra safety precaution. So not being one to sugar coat things, I will admit that in many cases, for a light paring action, I may opt to hold the material in my hand. I do this while making sure all of my digits are out of the line of fire, so to speak. But for most serious chiseling tasks, my work piece is securely clamped. So although it is not a method I would deliberately teach to others, it did make its way into the show. And consequently it received an overdubbed safety warning. But I appreciate you bringing this up if only for the fact that it makes the point that much more clear: clamp your workpieces for the safest technique possible. I wanted to say that I really appreciated that you showed how to repair the chipout. It is this sort of issue that drives me (as a beginner) crazy, so it is great to see approaches to dealing with them. Doubt I’d try to hold the stock in hand and chisel (don’t like that feeling in my spine), so wasn’t too surprised to hear the voiceover cautioning against this. hey marc, another great show. What kind of finish did you put on the pencil holders, or didn’t you put on any at all? Marc is doing us all a favor here and while he’s clearly getting some fame, I doubt that he’s getting much fortune. I can imagine that he and/or Nicole are up late at night wrestling with video editing software, or coding the home page. If you’re like me, you are clicking on to this website every now and then, maybe daily or more. I get at least the amount of pleasure out of this website as I do for my Wood Magazine subscription, and that ain’t free. Please click the Donate button and chip in $10 or whatever you think is the right amount to keep Marc on the hook for doing some more of these great videos! Thanks! Marc youre lucky, I turned out to be the prime example of what these guys are talking about. last week i was making a box for my girlfriend and i was holding the top down with my hand flat on the piece and i was using a chisel to take off material from the side. I slipped and put the chisel into my palm. It doesnt feel very good so i have to agree with these guys. All week ive been getting stories from people about what they have done and this one lady had a great one about her brother. He was holding something in his hand and using a box cutter to cut towards him, and he sliced all the way down his finger and into the top of his hand. Needless to say i went to lowes and bought a vice for my bench. Austin, stay tuned for the next episode. And thanks for the story Kyle. That sounds a bit scary. Box cutter cuts…….ugh…. Marc lets the blade on the Mitre saw stop before he lifts it so he will not shoot “wood rockets” all over the shop. This is a very good safety precaution because I think we have all shot pieces of wood because we lifted the blade while it was spinning. Marc, I’d be less concerned about the chisel slip than the way you were mitering those small parts on the table saw. Even if you have the sense to be super careful, I’d be afraid about someone out in TV land trying the same cuts. When I cut parts that small, I always use a sled and clamp the parts down to keep my hands away from the blade. But, recently I found something that works even better. I got a large V groove bit for the router table. It produces dead perfect 90 degree corners for mitered parts and it requires no set up like a table saw does. Just don’t want to see you get hurt and be like one of those old school shop teachers with fingers missing on both hands. That wouldn’t be good for your podcast career. Chisel safety is imperative, and any serious woodworker knows that you are far more likely to seriously injure yourself with a hand tool (especially chisels) than with a machine. There are a few safety issues that should be mentioned here. As far as the repair, you could have cleaned it up using the same router setup you already had. Also, you mentioned that the bevel cut was a dangerous one. There were two easy ways to make this safe. The first, and best, way to make it safe would be to cut the bevels on one piece of material and cut them to length for your sides afterwards. Another way to make this safer, is to do the bevels on a router table. ps Holding the miter blade down until it stops spinning is less about the part flying than it is about preserving the freshly cut edge. Boy it sure is easy to sit here and watch this podcast over and over and nit pick the crud out of it. Same goes for half of the video’s I have watched of David Marks and Norm Abrahams but I dont go to their sites to complain. I take what I need from them and move on. These podcasts serve as a great reference but they certainly do not condemn the audience to use the same technique especially if it appears unsafe to you. Marc is a big boy and knows what he is doing. It takes time and money to edit a podcast to correct it for every person that decides to be a critic so maybe some of you need subtitle that reads “DO NOT TRY THIS AT HOME”. The issue’s were clearly addressed in the podcast if the were not already by the live feed version. So hang it up already, we get the picture just like we know those arent really safety glasses Norm is wearing but were not on his website crying about it. He charges by the way, Marc doesnt. such a small easy project and sooo much information… thanks for the podcast.. does it not bug you when others HAVE to loook for things to correct you for. I do cringe when I see people cut towards a hand with a box cutter or chisel in their hand, but I guarantee that I did it at least twice last week. Thought about it during the cut but the safety alarm didn’t go off early enough. Nothing harmed, fortunately. Actually, for those looking for safety lapses in the videos, do what I do… when I see them, I try to remember not to do the same thing. It is surprising how many of the lapses we catch are actually what we do ourselves without thinking. If you’re referring to my comment about table saw safety Chris, I can tell you I’m a big fan of Marc and have known him from other forums for a few years and have exchanged email with him so I consider him a friend-not someone I’m raining on.my comments weren’t said as a criticism of him. I said it out of true concern for others who might try that without the same level of experience.If that comes off as being down on the podcast its not meant that way. If Marc hurts himself are you such a loyal fan that you are going to be there to make it all better anyway? I dont usually talk about myself in the 3rd person but here it goes. If Marc hurts himself, its Marc’s fault but I still expect everyone to be there to “make it better”. I am generally a big baby when injured and I get quite needy. Seriously though, I do not want this to spiral into something negative. This only makes my recent post about safety more valid. There are opinions out there that I may not completely agree with. I definitely don’t feel that making the miter cuts on the tablesaw was wrong in any way. I did state that it was a bit more dangerous than our average cut, but was very clear about what tools I was using to minimize the danger. Part of the reason I would not use the router, or even cut the miters while the boards were still long, was for accuracy. Neither of those methods will give me the result I am looking for. So as you can see, much of this will really come down to opinion. And I respect everyone’s opinion. With the exception of the chisel incident (which was very clearly explained in the video), I do not feel that any of the techniques shown were inappropriate. Anyway thanks for the great videos and the fantastic nerdy humor in them. I learn tons from your projects and am entertained all at once. Can’t ask for much more than that. Nice video. Your videos are fun in general I’ll keep watching even thought this is mostly known and basic info for me. Still, even in this ep. I picked up a couple details I’ll try, mineral spirits to check for burns and alternating tabs for the taped miter glue up. I usu. have all the tape on one end. To weigh in on the safety talk I don’t consider your chisel work dangerous. Just as long as your not chiseling toward yourself or your hand all your risking is the piece. That’s not a safety issue it just a different method of work. I would have the confidence to chisel like that and consider it very unlikely I would gouge my piece. A couple comments on the fix itself. I’ve had a problem with CA glue wicking into end grain and leaving a dark blotch, so I’m careful about keeping it away from the end grain. This might not be an issue with the thick CA glue, but I only have medium. For an alternate fix idea I would have been tempted to take some wipes with my shoulder plane to make that chip out disappear. I’m really liking my shoulder plane lately. For all the rest of you, I submit that if you are aware enough to actually notice an error or two here and there with any one’s operation from David Marks to Norm to Scott Phillips to Marc (Yes, he should be mentioned in the company of the others) then you are competent enough to note it, file it in the “Do not try this” file of your left hemisphere and move on, unless of course you are Marc’s Mommy or his Wife, I suspect they have comment rights. This is a service that he provides and I think we should all just pay attention closely and learn what we can before the day comes that he is too busy or too popular or the demands on his time simply become too great to do this all for free anymore, and this site changes to a subscription type service. I can guarantee you all that day will come and maybe sooner that we hope. Tell me, will you pay to watch and criticize or just move on to something else that is free? Also please remember that there are very few of these podcasts out there and we could always use another one if it were well done, and while you are filming and standing on the soapbox you can preach your version of shop safety! I suspect more than a few of us would actually learn something from it. so post away. Note of disclaimer here: I am in no way affiliated with Marc, I stand to gain or lose nothing by expressing my opinions here other than to be supportive of his efforts! What Chris from Iowa said! Great job once again Marc. LMAO! I think that to myself every time he goes through his safety speech! The main thing here about shop safety is knowing what you are doing. Thinking through the processes. Making cuts onto small pieces, Marc obviously thought about it. He had his push sticks ready and even said on the video his thought process about the steps. Woodworking by it’s very nature is not a safe hobby. With all those machines and blades moving at a high rate of speed. Safety starts with thinking about what it is you need to do and then finding the safest way to do it. This is news to me. Any data to support this statement? I was surprised you made the resaw cut by hand, without the aid of a fence. Is their any disadvantage with use of a fence, or do you simply trust your bandsaw skills (and bandsaw), that you didn’t think it was necessary? Hey Nels. Actually, sometimes I actually find it easier to follow a simple line, than to set up the fence for the drift. I hadnt used my bandsaw in a while and the blade is a bit dull, so I didnt think it would track properly against the fence. So for a quick cut, I just cut it by hand. And to be honest, if you get comfortable doing that, you will probably be a little better off. If your fence is ever out of whack and you need to get some stuff cut in a hurry, its nice to know you can just follow a line. Great epidsode! I plan on making some of these myself for holiday gifts. I really like what you did and I really appreciate all of your little tips and safety tips. Best of all, how to fix any boo-boos! :-) You didn’t cause them but it’s nice to know how to fix them. I can’t say enough about this site. And I agree with Mathias… my donation is en route! Just curious: What type of finish did you use or would you recommend for this type of project? I noticed that the grain on the box sides were running vertical. Don’t you need to worry about the wood moving horizontally across the grain and blowing out your joints? I am just getting started, and I was wondering if I needed to have the grain run horizontally. That way if the wood moves, all 4 sides will move together. Thanks for the great videos! Keep up the good work. Hey Anderson. Although you should always be concerned about wood movement across the grain, in this case it is negligible. The smaller the piece is, the less of an issue movement becomes. So in these smaller pieces we can sometimes break the rules. I have made numerous pencil holders like this that have lived in Southern California and Arizona and there have been zero adverse effects. You certainly could run the grain horizontally if you prefer, but I really prefer the look of a vertical grain orientation in this design. Marc, I just completed my first five pencil holders. They are going to be xmas gifts for friends and family. I used poplarfor the sides and oak for the base.The only thing I did differently was use hot melt glue to attach the sides to the base.I cannot believe the constant nit picking on this site,can’t they use common sense and realize that every craftsman in every shop or jobsite does not require safety glasses,earplugs,dustmask and a clamp to pare a small piece of woodsuch as that. Do these people drive over the speed limit? I made one of these pencil holders, but shorter so it can hold Q-Tips in the bathroom. I made mine yesterday, before watching this video. Loved the tape trick to help with the glue-up of the side. I just used a rubber roller to get a very thin layer of glue and used rubber bands to apply clamping pressure. The other thing I did differently was to create a dado in the base to accept the box-top. That also helped with a place to put the box-top assembly and keep it squared-up while the glue for the miters dried. I used the TS to cut the dados, and as a result, my dados are cut all the way through. Would love to see a procedure for routing a stopped dado to do this. I’m thinking router table using stop blocks and starting with a plunge cut…but the math makes my head hurt! Thanks for a great video!! Kudos for all your efforts to share some woodworking knowledge. I’m curious as to why you didn’t rip the miters before crosscutting to length? If a pencil holder comes out of one piece, that’d be 2 cuts instead of 8; if out of 2 pieces, 4 rather than 8. It’s possibly safer too albeit I have no empirical data to support that thought. That is certainly a viable option Gary. And it might be safer, depending on your technique. For me, I like the smaller pieces because I can run them across the tablesaw with my paddle in the same position the entire time and with equal pressure across the board. If I try the same technique across a longer piece, I will surely wind up putting more pressure at the point where the paddle rests, leaving me with a slightly less consistent cut. Not how much of a difference does that make in the final result? Probably not much. But when dealing with miters, I like to get them as accurate as possible. So for me, that was the most logical way to get the job done. You might find your method to work better than mine. So just use what you are comfortable with. I am sure the results will be good either way. Yup, you can cut them at once if you like. I finally made a few pencil boxes…three years after the original post. Thanks Marc for your video. I’m a slow starter. I really enjoy your small holiday projects that can be batched out and provided to the family and friends, I reviewed the pencil holder and of all people the wife suggested using the same technique for tissue box covers, As always thank you for the inspiring and entertaining videos. If you are looking for a small holiday project idea, I would enjoy watching your interpretation of a tissue box cover. I started making these last night. It looks like I’m going to get 5, maybe 6 out of the batch I’m working on. Pretty easy project, I only have a few months under my belt of real woodworking. The only problem I have is I don’t my table saw is very accurate. I’m going to try cutting the miter’s of the uprights on a router table and see what happens. Hey Marc – why did you use epoxy instead of normal wood glue to glue the holder to the base? I just through it might be a little stronger than standard yellow glue. Probably didn’t make much difference though for something so small.